Sylvia and Tony Convey are central figures in the history of self-taught and outsider art in Australia. Their artistic output has been prodigious and rich. And while they are artists to the core, their tireless support for other creators and contribution to the field in other ways must also be acknowledged. Their work is different in many respects, and they have hardly ever produced collaborative works, but they are bound together by common feelings of place, history, worldview and an immense feeling of the numinous in things. For the Conveys, as with most artists, works on paper is where all these things are revealed most directly and in their rawness. Yet, their public careers have been defined overwhelmingly by paintings, sculptures and constructions. 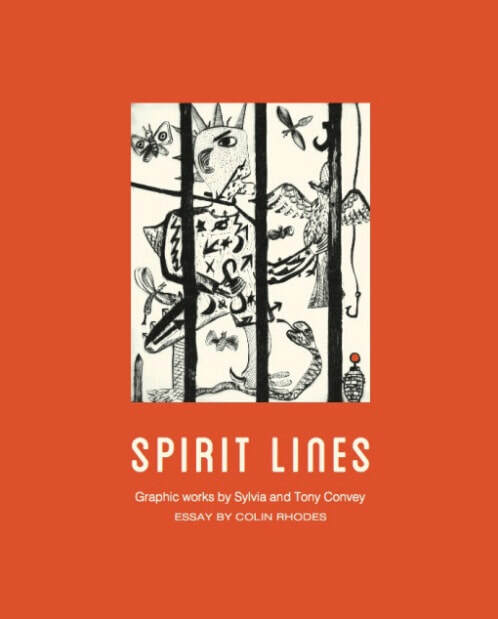 This lovingly and beautifully produced book devoted to graphic work spanning the full spread of their activities to date is therefore both a revelatory and deeply moving document. Superb quality illustrations take the reader through an artistic journey at once intriguing and enlightening. At times poignant and deeply personal, these visionary emanations of particular places, people and journeys are also vehicles for more universal messages and always enlightening. But this book is also testimony to two people indissolubly linked through the strongest of ties. Together they have shared new discoveries and great swathes of highs and lows, and pain and joy in art and life. Their work comes from a place unconcerned with artistic fashion or desire for cultural assimilation. It is a privilege that some of it is shared with us in this book.